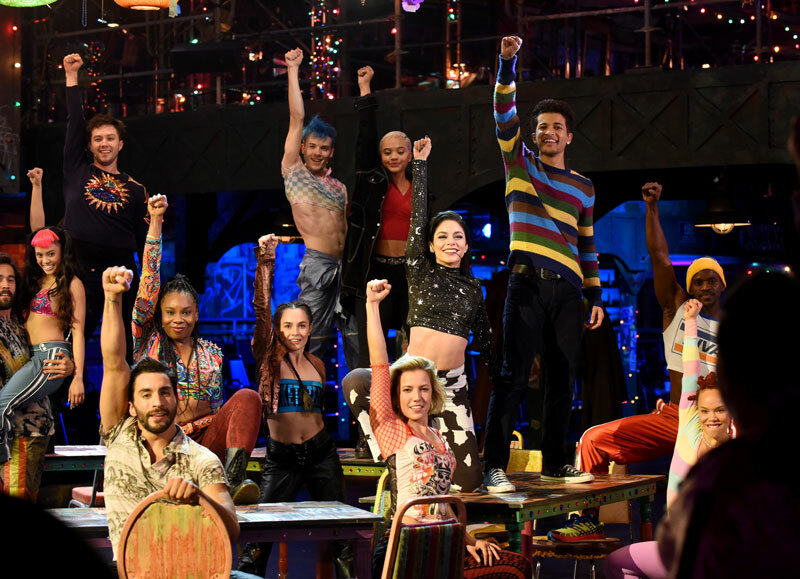 The live broadcast of Jonathan Larson’s Tony Award and Pulitzer Prize-winning musical Rent was a highly-anticipated event for theater fans everywhere. 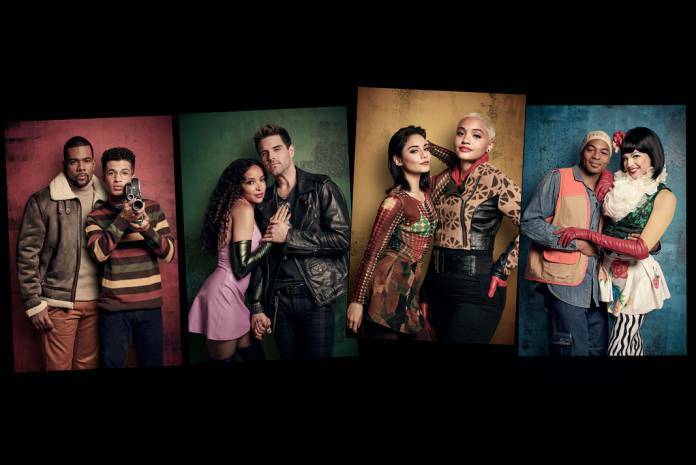 While many younger fans consider this show to be a period piece and others view it as too contemporary for their taste, this story of the struggles of a group of young people dealing with issues of identity, love, and loss in the face of the 1990’s HIV/AIDS epidemic in New York has some universal themes in today’s world. It is ultimately about inclusion and diversity, staying true to yourself, and celebrating life despite its challenges. The FOX network faced its own challenges in putting on this live show – the production was beset by difficulties from the get-go. Here, at least in my East Coast location, technical difficulties prevented many viewers from seeing the opening number. When that problem was sorted out, we were informed that an unfortunate accident had left one of the leads, actor Brennin Hunt (Nashville), who was the production’s Roger, with a broken foot. Therefore, what was supposed to have been a live performance was mainly footage that was shot at the dress rehearsal. The end of the show was re-staged and performed live and the difference was palpable. The unfortunate accident prompted many viewers to ask, why didn’t the powers to be at FOX hire an understudy? Many of us in the theater world are used to the small playbill announcement that ‘at this performance the role of _______ will be performed by _________.’ It can be a disappointment for some, especially if the person being replaced is a big-named star, but generally the understudy is equally as talented and up to the part. (Never mind the old trope of a performer going out there a nobody but coming back a star!) 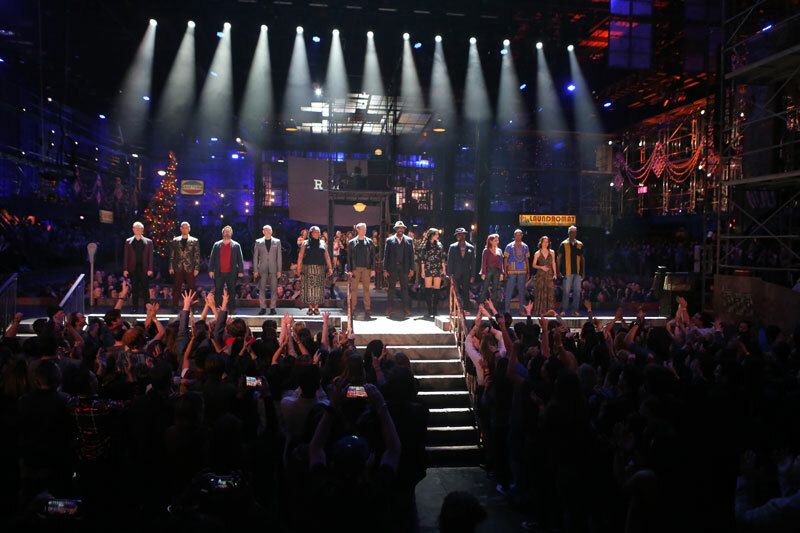 The rest of the cast gets to perform as planned, and the audience still gets to see a live show. Not so last night, where the producers decided to go with pre-recorded footage that seemed to lack the energy and excitement of an opening night performance. While most of the cast members were solid, there were many instances where they needed to pick up the pace, and a few instances of notes that were just not hit or voices that just didn’t seem up to the challenging score. I was particularly disappointed by some of the vocals by Valentina (Rupal’s Drag Race,) especially in the song “Today 4 U” and the apparent lip synching in the song “Contact.” Valentina’s Angel was touching when interacting with Brandon Victor Dixon’s (Jesus Christ Superstar) Collins, but I felt as though Mr. Dixon was carrying the scenes. I was also somewhat disappointed by Kiersey Clemons (Dope, Extant, Transparent) as Joanne. Her vocals were fine, but I felt her performance was not strong enough to give the impression of a high-powered lawyer, nor did it match the focus and intensity of her on-stage partner, Vanessa Hudgens (High School Musical, Grease Live, Powerless, The Princess Switch), who played Maureen. R & B artist Mario was fine as Benny, but did not stand out for me. There was a nice touch though of a portfolio prop, where for once, the audience got an actual visual of Benny’s grand plans for upgrading the building that he owns. Brennin Hunt was also okay as Roger. He sang his part well, but his performance again seemed to lack the intensity of other performers I’ve seen as Roger onstage. Singer Tinashe (Empire, Dancing with the Stars) was more memorable as neighbor Mimi, who forms a relationship with Roger. She looked age appropriate for the part and sang and danced her way to a totally-believable performance as the young, thrill-seeking, adventurous, and ultimately reckless young exotic dancer. The strongest performances, not surprisingly, were by the cast members with more theater cred. 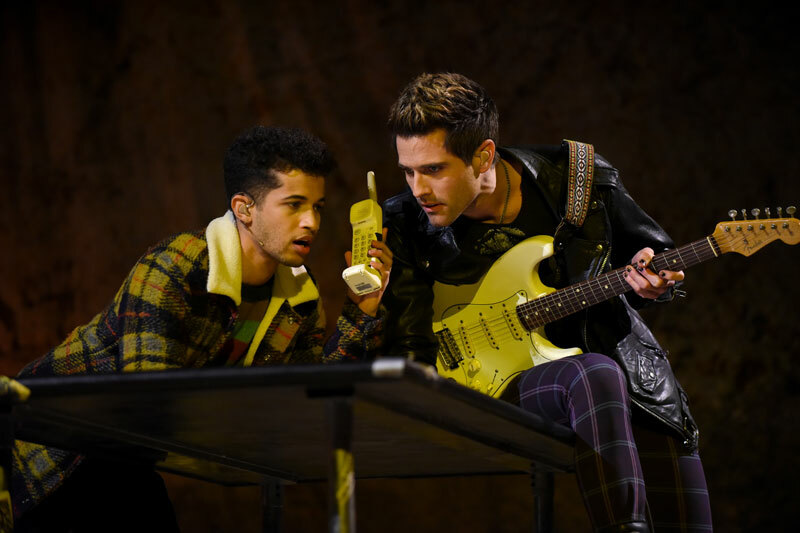 Jordan Fisher (Dancing with the Stars, Grease: Live, The Teen Beach Movie) who also played the roles of John Laurens/Phillip Hamilton in Hamilton, was excellent as filmmaker Mark. He is the one who chronicles the lives of his friends and the people of the neighborhood, and his performance of the song “Halloween” was especially poignant as he faces loss and his loneliness. Vanessa Hudgens, who recently starred on Broadway as Gigi, was a marvel to behold. She was on fire as performance artist Maureen – so hot that when her character says the line, “There will always be women in rubber flirting with me,” all I could say was that I can see why. Ms. Hudgens gave an unabashed, unashamed, and electrifying performance and made the part her own. My favorite performer of the night was Brandon Victor Dixon, whose Broadway credits include The Color Purple, Shuffle Along, or the Making of the Musical Sensation of 1921 and All That Followed, Motown: The Musical, and Hamilton. Mr. Dixon wowed me with his performance as Judas in last year’s televised production of Jesus Christ Superstar and wowed me again as Collins last night. From the moment he choked out the words “It’s over” at the end of the song “Contact” through his emotional reprise of “I’ll Cover You,” I was in tears. As a performer Mr. Dixon has the power to move and inspire, which to me is what musical theater is all about. One instance where the cameras seemed to add to the experience of Rent was during the poignant song “Will I?” Mark walks through the neighborhood filming members of the Life Support group, the homeless, and others who are facing their own mortality – some alone, and some with the support of others. I thought that the camera work and the scale of the set worked together to give some perspective of the scale of the HIV/AIDS epidemic as it decimated whole neighborhoods. It was a humanizing moment and a sadly beautiful song in the production. But just as the cameras seemed to work in that scene, there was another where televising the show just ruined it for me. As Mark and Roger were singing the song “What You Own,” they ran through the massive warehouse set, singing directly to screaming girls in the audience rock star style and ending the song with a stage dive. Way to take us out of the story and out of the moment guys! The song was no longer the epiphany it was meant to be for the characters, with Roger ready to stop running away and face his truth, including his love for Mimi, and Mark ready to protect his artistic vision and not sell out to the sleazy media show that wants to hire him. 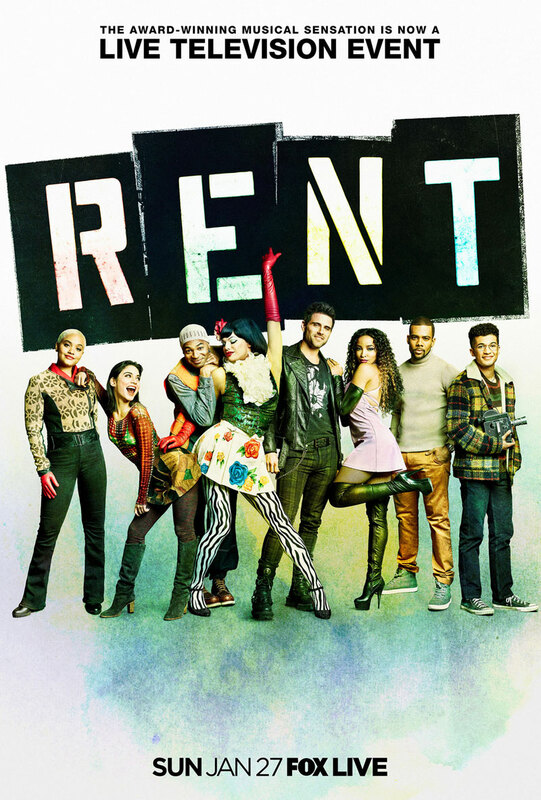 Instead it felt like self-congratulatory excess and not part of the message that Rent is meant to convey. And even worse, there was still more story to tell. We had to go from that ‘hey look, we’re doing a show’ moment to Mimi’s near-death experience and the reconciliation of the group of friends. This part was performed live, with Mr. Hunt’s broken ankle propped up on a chair and entire cast giving their all. The end did not quite make up for this grievous breach in the show’s integrity, but the finale did, especially for theater fans and Rentheads everywhere. All-in-all, I’d give Rent a B-. It was okay but could have been much, much better. They got some things right, but in my opinion, it did not come close to seeing a live performance. What did you think? Next articleFree Early Alita: Battle Angel Screenings Set for January 31!